The National Bureau of Economic Research declared this week that the Great Recession ended over a year ago. Yet, for some reason, the average American isn't ready to break out the champagne. "Every single one of the individuals who wrote the report needs a serious reality check," said Bob Johnson of the Queens borough of New York, who is 46, had worked in communications and has been looking for a job for more than three years. The American working class is hurting. The unemployment rate is only marginally down from the peak and the economy has been losing jobs over the last three months. Households were $1.5 Trillion poorer last quarter, and $12.3 Trillion poorer than three years ago. Most of this is reflected in the crushed dreams of retirement. 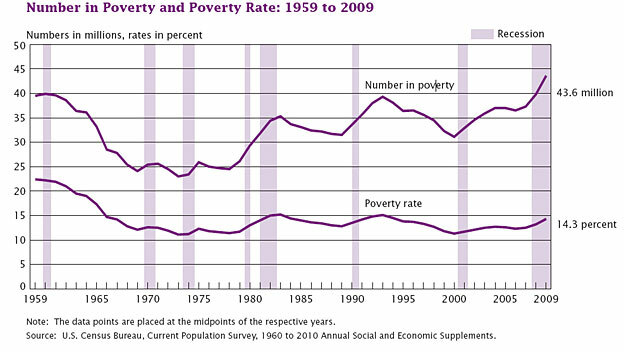 The poverty rate is at a 15-year high. Nevertheless, the economy is improving, right? That depends on who you ask. The summer of 2002 was a drought year in the Klamath Basin. An estimated 70,000 salmon died that year after the Bush administration "ignored its own federal biologists and divert more water from the Klamath River for farm irrigation". According to documents, the decision was made because the farmers generally voted Republican. The Bush Administration then went on to order that water continue to be diverted for another eight years. Only 24,000 fall chinook spawned naturally in the Klamath in 2004, followed by 27,000 last year. The analysis from the U.S. Fish and Wildlife Service identified low water flows as a prime culprit in a major salmon kill on the Klamath River in 2002. 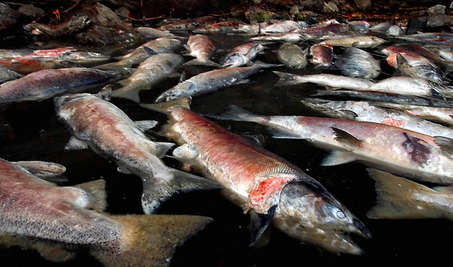 Because it takes several years for salmon to reach peak reproducing age, the effects of this huge fish-kill only started in 2005 when the National Marine Fisheries Service abbreviated the commercial salmon season. It cut the income of west coast fishermen "by 50 percent". California and Oregon indian tribes, that have depended on salmon fishing for thousands of years, also had their fishing quotas cut back by as much as half. It's easy to look at this example as an exception based on petty politics, but that would require you to overlook five centuries of political and economic policy. When you look around the global environment today you will see nearly every animal species, large and small, in trouble. It doesn't matter if they live on land, water, or air. Have we got your attention now, Wall Street! Wall Street's troubles are compounding. It appears that small investors have waken up to the fact that the game is rigged. They are fleeing from casino capitalism in droves. In a speech Tuesday, Mary Schapiro, chairman of the Securities and Exchange Commission, said the SEC was informed by retail brokers that the Main Street investors they cater to "have pulled back" from the stock market since the flash crash. To buttress her point, Schapiro noted that stock funds have suffered net outflows every week since the flash crash. When I wrote this well-received essay a week ago, the net outflows were beginning to gain attention from the media. In the past week, things have gotten much worse for Wall Street. Because the lack of new "dumb money" flowing into Wall Street, as many as 80,000 banksters will lose their jobs. Since Washington refuses to enact serious reforms of Wall Street, and the regulators refuse to do their jobs, it has come down to mom and pop investors to starve Wall Street into submission. Read more about Have we got your attention now, Wall Street! Europe is in trouble again. After nine years of work, $330 Billion in treasure, and nearly 1,300 American fatalities, bankers might ultimately do in Afghanistan what the Taliban could never accomplish. Even as it battles a resurgent and spreading Taliban, the beleaguered government of Afghan President Hamid Karzai is facing a more immediate threat: a run on the country’s largest banks. This week, droves of depositors rushed offices of Afghanistan’s Kabul Bank, pulling out their money amid concerns that bank has lost millions of dollars. BBC News broadcast images of Hummers and SUV’s racing to the bank, a troubling sign of growing mistrust for Mr. Karzai’s already heavily criticized government. Something in the neighborhood of $200 to $300 million in deposits have been withdrawn in just a couple days, about half of all the bank's assets. If the stampede continues for just a few more days the bank will fail. So why is this important? Because the Kabul Bank is what the government uses to pay its teachers, police, and soldiers. You see Wall Street functions much like Las Vegas. Their immense wealth depends on the continuing myth that their games aren't rigged, and the willful denial of reality by the suckers. Just like Vegas, no one wants to talk about the money they lost playing the stock market. Instead, all you here about is how everyone is getting rich at the blackjack table. If you aren't getting obscenely wealthy betting on interest rate spreads then there must be something wrong with you. In reality, the reason why you lost money is because the game is rigged. The House always wins in the end. The suckers are the ones who think there are rules. Like Wall Street, Vegas exists to separate you from your money. Wall Street may seem all powerful, but like Vegas it has an Achilles Heel - if the people don't feed the beast it will starve. If the greed of The House gets to extreme, and the rigging of the games becomes too obvious to ignore, people will stop gambling at the casinos and in the stock market. The House goes broke. That tipping point, where the willful denial of Main Street starts to break down because the game rigging is so blatant, may have finally been reached. A relatively obscure case in Norway shows just how different the United States is from the rest of the industrialized world. The Oslo Stock Exchange was halted by unusual trade action. It seems two Norwegians were trying to manipulate stock prices. We believe the two are behind a number of cases of price manipulation. They have set purchase and sales orders that have not been real, because they have had another motive, namely to move prices, "said Stenberg. In other words, they did exactly what every single bank on Wall Street does every single day. In New York it is called High Frequency Trading. In Oslo it is called getting six years of jail time for breaking the law. So who is right? Is Norway some Socialist Hell for not allowing the free market to work, allowing faster traders to skim profits from slower traders? Or are laws in the United States too lax, allowing people to take money from the system without adding any value, thus destabilizing the economy? To answer that we need to look at a couple more examples. Perhaps the worst insult you can hurl at a politician these days is to give him the middle name of "Hoover". Such as George Hoover Bush and Barack Hoover Obama. 80 years later Herbert Hoover is still the standard for the "do-nothing" president in the face of economic collapse. Like most easy comparisons, these examples lack details. That's because the names are there for the purpose of accusation, rather than enlightenment. However, if you dig down into the individual economic policies of Hoover, Bush, and Obama, the story gets much more interesting. As Mark Twain once said, "History doesn't repeat itself, but it does rhyme." I'm not going to try and find direct connections in this essay, just broad picture comparisons. If the reader confuses the two, then that will only mean I was justified in writing this. Three years ago this past Saturday the economic crisis struck. That's why the comments by Alan Greenspan on the very same day on Meet the Press are worth noting. "There is no doubt that the federal funds rate can be fixed at what the Fed wants it to be but which the government has no control over is long-term interest rates and long-term interest rates are what make the economy move. And if this budget problem eventually merges to the point where it begins to become very toxic, it will be reflected in rising long-term interest rates, rising mortgage rates, lower housing. At the moment there is no sign of that because the financial system is broke and you can not have inflation if the financial system is not working."